Hi everyone, How was your Easter weekend? I hope you all had a lovely weekend! 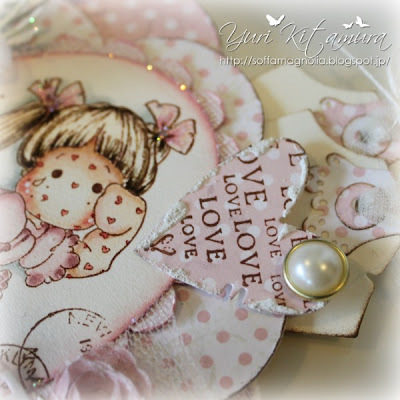 I’ve been making a few cards lately and this is one I did using one of the sweet Tildas from Magnolia's With Love Collection called Tilda with Heart Spots. How cute is she! ... The image is stamped with Archival Ink coffee on watercolor paper(Mat Thunders - Muse) and coloured with Distress markers and Distress ink pads as always. All the paper edges are distressed with Paper Distresser, Distress ink Spun Sugar and Walnut Stain . I also added a bit of texture and sparkle to around the edge of papers with Stardust Stickles. This card is shaped with a GoKreate die, called Large Frame Flower #1. This one can be found here. I made the roses with the Marianne Design Chinese Rose die. Medium : Distress markers, Distress ink pads, White gesso, Stardust Stickles, Stickles dry fine stardust gritter, Ceramic stucco. 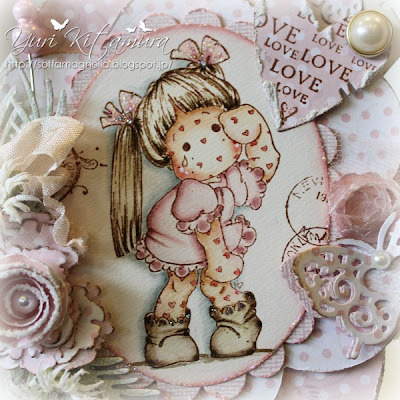 Dies : Peonies, Tilda tag, Tea Label Shapes, Sprawling Ferns - Magnolia DooHickey's Dies, Large Frame Flower #1 - Go Create, Chinese Rose - Marianne Design, Butterflies #1 Creatables - La-La Land Die, Nestabilities - Spellbinders. Embellishments : Chrysanthemums - Kort & Godt, Seam Binding Ribbon - WOC, Vintage Pearl Pin - inkido, Cheese cloth, Rose lace, Half pearls, Lace. Clothes and Boots - spun sugar, Victorian Velvet, Frayed Burlap, Walnut Stain, Black Soot. I have another card to show with you too for this week. I'll see you again soon! 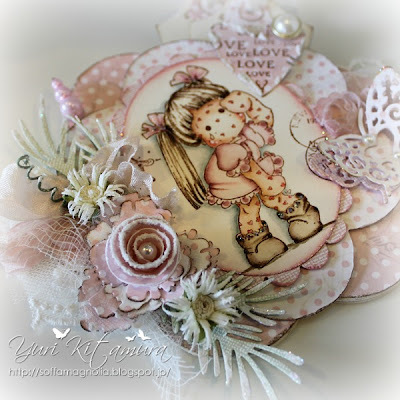 Love your gorgeous card, adorable sweet tilda and fab details.Thank you for joining us at Simon Says Stamp challenge. This is beautiful card. Sweet colors and Tilda is so cute. Adorable card, Yuri. Tilda looks so sweet. Love all the pretty papers and die cuts. Thank you for sharing it with us at Midweek Magnolias.